The ‘Oculus’ Mirror Has Got It In For Holland Roden…What Will It Make Her Do? Warning: This article contains major spoilers for Teen Wolf Season 4. ‘Tis the season of the ladies. Though Teen Wolf said goodbye to Allison, its female lead, after star Crystal Reed asked to be written off the show, the MTV hit will return for its fourth season on June 23 heavy on the girl power. When we caught up with executive producer Jeff Davis after the epic season three finale, he was quick to praise the show’s two new female additions, Kira (Arden Cho) and Malia (Shelley Hennig) and teased what we can expect from them next season. Though Hennig is signed onto to be a series regular in season four, Davis and the writers weren’t sure if she would even be returning at all. And Davis continues the gushfest when talking about Arden Cho, who quickly became a fan favorite after joining the show midway through season three. And romance will also be on the agenda for Kira and Scott (Tyler Posey), albeit a slow one due to his first love Allison’s tragic passing. Of course, he’s speaking of Stiles and Malia, who, ahem, wasted no time and got right to down to business in season three. But judging from the way the show handled the Scott-Allison-Isaac-Kira non-love-square situation, you can rest easy knowing Stiles probably won’t be at the center of a love triangle in season four. In fact, you can expect to see Malia and Lydia (Holland Roden), Stiles’ longtime crush, team up in season four, not engage in cat fights over boys. As for Derek (Tyler Hoechlin), he-who-often-hooks-up-with-a-woman-who-turns-out-to-be-evil? “I can some tease some major events with Derek,” David coyly spills, but confirms the recently-resurrected Kate (Jill Wagner) will not be a love interest for Mr. Hale. Teen Wolf returns for its fourth season on June 23 on MTV. I’ve added the recent two pictures of Holland’s instagram – @hollandroden in our gallery. 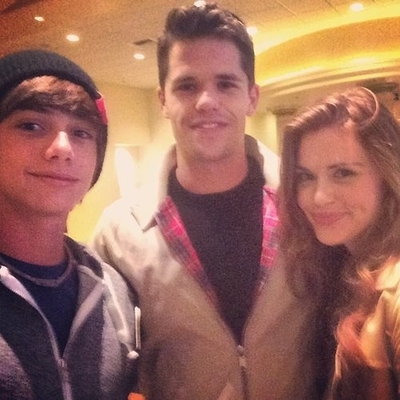 Also yesterday (April, 1st) Holland and Max Carver were spotted at the cinema in Los Angeles, California by a fan. Holland Roden covers Line Magazine and issue for April 2014. I added two scans in our photo gallery. Very soon I will upload pictures from photoshoot. Stay tuned! Holland Roden Daily is finally open! Welcome to your largest source for all things flawless Holland Roden best known for her role as Lydia Martin on MTV’s hit show Teen Wolf. We are having the largest gallery for Holland Roden on the web with over 27 000 pictures. To be in touch with updates around Holland and Holland Roden Daily you can follow us on Twitter or like our Facebook page. We’re brand new site and we’re looking for some affiliates. If you have a website and you need affiliates you can contact with us through e-mail: hollandrodendailynet@gmail.com Last few days I uploaded some photos in our gallery – Appearances, Candids, Photoshoots, Instagram photos, Screencaptures, Stills and more. Enjoy!! !